A woman has issued a plea to help find a thief in Northampton who stole £100 that was intended for a trip away with her son. She had intended to take him away to London on Monday to visit the London Eye, Madame Tussauds and the Rainforest Cafe but is now unsure whether she can afford the day out. She told the Chron that her bag also had her son's medical notes in and as well as his medicine. Gemma said: "He is 12-years-old and just started secondary school, he has been made a school ambassador for Year 7. "The cash was supposed to be for my son, we are supposed to go to London on Monday for a trip away together. So I'm gutted." The thief took Gemma's bag from the footwell of her car on Tuesday, February 7 and also stole a bottle of perfume and her Luis Vuitton purse. Gemma was visiting a friend in Watkin Terrace, The Mounts, and wants to warn others to be more vigilant when leaving personal possessions in their car. A spokeswoman for Northamptonshire police said: “We were called on Tuesday, February 7 after 9.30pm. A bag was taken from a footwell of a car. 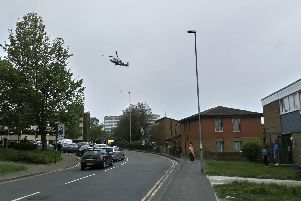 A man on a push bike was seen leaving the scene with a bag in hand. Northamptonshire Police are now investigating.